It's been a while since I've done a more general game design post, and I thought it was high time I did a few articles on a particular subject: how the game reacts to the player and vice versa. Essentially, this is gameplay, but I'm going to talk about it is used to encourage the player to play and experiment with doing different things. 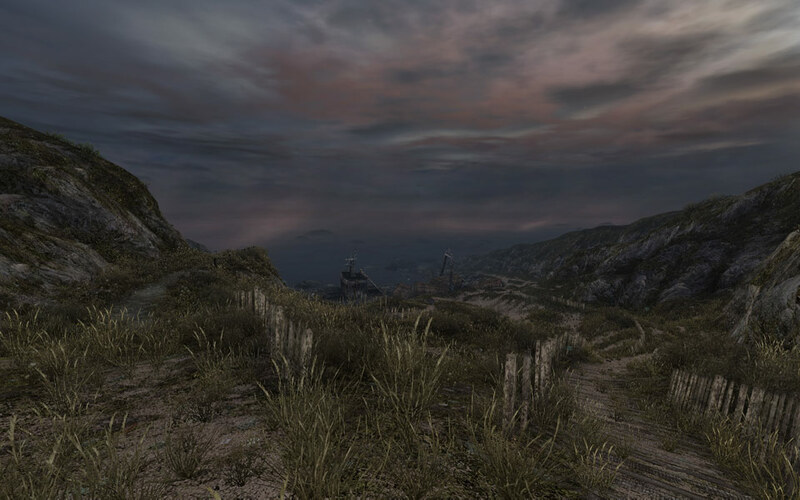 Ultimately, gameplay ends up being about providing a series of rewards to the player. 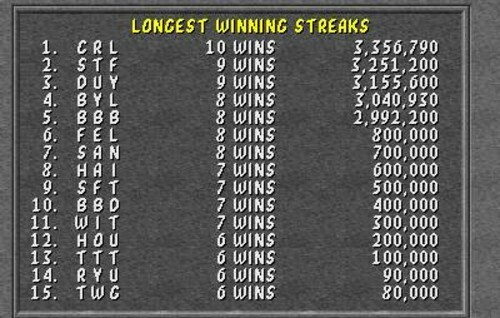 In old arcade style games, this was represented by a score measurement; the score was a mystical representation of the value of the player's success, be it how long they'd survived, how many times they hit a target, avoided an enemy or otherwise achieved whatever goal the game deemed "success". This provided the ability to players to compare scores and see how well they did against each other. 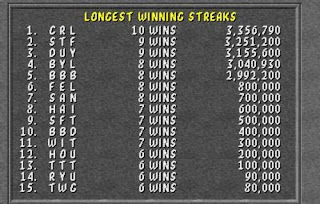 I'm sure anyone who remembers arcades or old console systems remembers competing to get their initials on the leaderboard displayed by the game. In modern games, you've still got measurements like that. You can measure your stars in Angry Birds or your top score in Bejeweled. In first person shooters, you can compare your rank against other players, or kill/death ratios, or win/loss ratios, or countless other statistics used to measure a player's overall "skill level". Starcraft and Heroes of Newerth continually adjust the rankings of individual players based on their performance. This comes down to wins in games or otherwise performing "good" actions. Players will frequently want to see how they go against other players, or even see if they're making improvement against themselves. The question then that remains is how to tell the player that they are doing something "right". The essence of this is training the player to play a game. This is the simple mechanics of "how do I move? ", "where do I go? ", "how do I interact with that?". Some things may be evident from their appearance. If you see a big angry looking guy with a gun and he's pointing it at you, in most cases you're probably safe to assume that you either want to get out of the way or shoot him before he shoots you. Many players might assume that a large white pack with a red cross in the middle might be something that would give them health, but you need to make sure of that the first time it happens. Basically you need to train the player that "if they take action X, they will end up with result Y". This is letting the player know how to play the game. The thing as a designer to make sure of is that this experience is kept consistent. If a player suddenly gets a different result from the action they've always performed, there needs to have either been a clear warning that this would happen before they've done it, or a clear indication immediately afterwards as to why this occurred. Take Baldur's Gate and the cry of "My sword has no effect" when a character was unable to hurt an enemy because they needed a different/more powerful weapon in order to deal damage. This immediately told the player "you're not getting the desired result, so you need to try something different". To fail to give the player some kind of audio or visual cue as to this difference will only leave them annoyed and frustrated. It should only be done when you have a specific reason for breaking their expectation. In this vein, take "I Wanna Be The Guy". This game deliberately sets out to confound the player by building an expectation and then breaking it. For example, while walking under a tree, an apple falls down and can kill the player. However, not all of the apples in the tree fall, so it's up to the player to work out (through trial and error) which ones do and don't fall. After this, the player can jump on ledges above the trees. At this point they discover that the remaining apples will actually fly UPWARDS and potentially kill them as they jump over the top of the trees. This deliberate breaking of the player's expectation is specifically designed as a challenge (and presumably to infuriate), to the player to force them to learn and remember exactly what to do and how and where to do it. 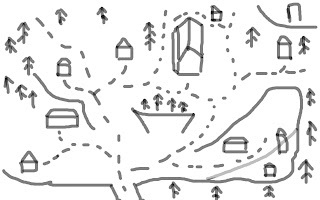 This is the game's specific design. Do not expect to be able to get away with this tactic unless that is your express aim, and that you make it very clear from the start that the player cannot rely on any of their expectations. Simple things like taking/avoiding damage are simple quantifiers for players to use to measure their intermediate success in gameplay, just like point scores. Point scores can also be adapted to a more ongoing measure - experience. By completing actions, players are rewarded with experience, which lets them know they have made progress within the game itself as well as in their character. Experience gives a player a quantifiable measure of advancement within the game, as can see something direct to work towards. In effect, it's giving the player a reward for performing. An important part of these kind of rewards is making it clear what the player is receiving a reward for. Is it for performing well in gameplay? Is it for reaching a particular point in the game? Is it a time based bonus? When showing a reward, it's helpful to tell the player what that reward is for, so that they will attempt to continue to emulate that sort of behaviour or performance. Player completing a fight without taking damage or missing a shot like to receive rewards for that success, and are right to do so. That said, there are potentially some issues with rewarding specific types of behaviour, which is what I'll discuss in my next post. Level design is a finicky business. It's very enjoyable and rewarding, but it's crucial to pay attention to those small details. I'm not just talking about making sure people can't see things that they're not supposed to see or to make sure that things aren't floating in the air, although those are very important things too. The point here is to make sure that items in your level are placed with purpose and that you're using them to build an aesthetic, but not make them seem too ordered. Let's talk about what I mean with some examples from the level I've been working on. Again, keep in mind that these are toolset shots of a work in development, so it's not using proper lighting and rendering. Basically what I'm saying is that it'll look better when you see it in The Shattered War. 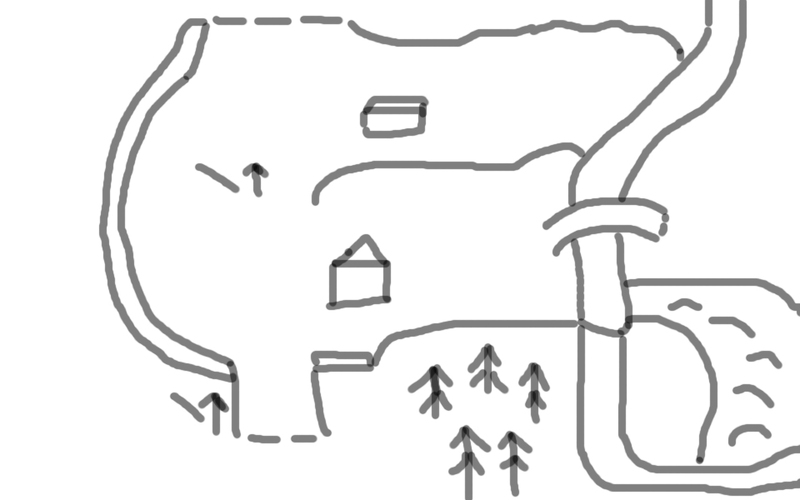 When the player sees this particular house, this is roughly the angle they'll be coming from. 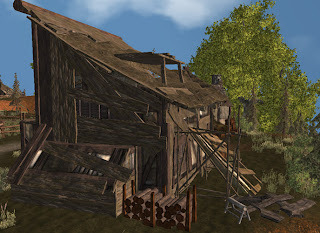 They might notice the cylindrical pole up top (put there to obscure holes in the model's roof), the upright pole, and the chopping block and giant logs in the background. These likely become increasingly more noticeable and aim to paint a picture about the house. You'll also note that the house model I picked also looks like it's been cobbled together with beams and boards. 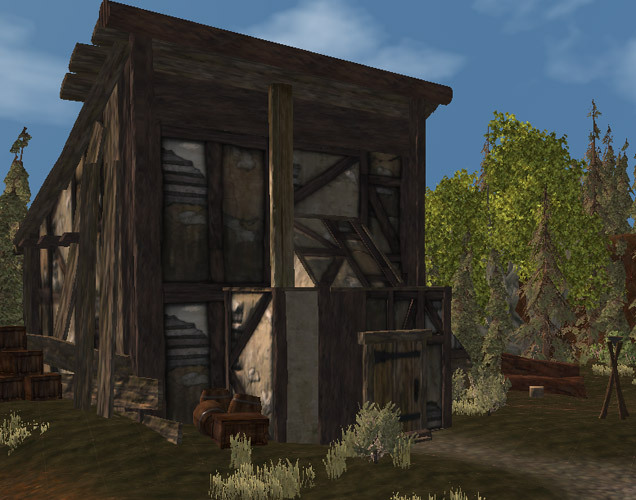 The barrels and crates can also support the idea that it's still not quite finished. One other issue with this house it that it needs to block off access to a more gentle incline that would lead off the edge of the map. 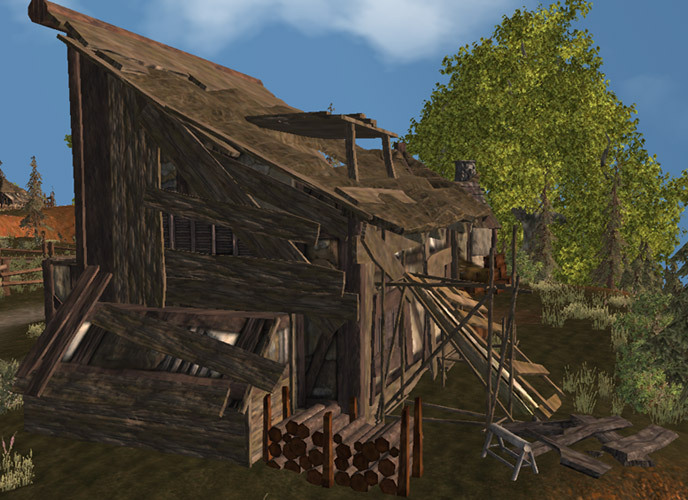 In order to fit this need, I extended this concept of the house being worked on, by adding a whole lot more wooden struts, rubble and building clutter behind the house, in a seemingly semi-random fashion. It all should "fit" together, but it can't do so in a tidy way. Here is looks like either the wood is being used to support the house, or that further work still needs to be done. This both augments the visual theme of the house while fulfilling the functional needs of the level. While it's not really realistic for anything else to be built on the end of the house as it is, that suggestion makes the player realise that they can't walk there, so won't attempt to, or if they do, won't be surprised/annoyed when they can't. Taking another example from the same level of a vegetable garden in front of a house, it was necessary to do a few things to fill in here. Of course, for the most part, it's quite possible to just trample over the garden, unlike the wood mess. 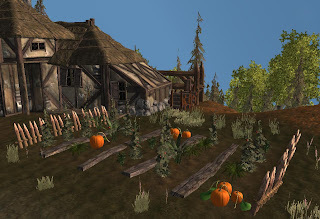 The first step is with the terrain itself, lowering the "garden beds" and texturing them to be dirt instead of grass. This gives the impression that they've been dug out slightly. Putting down the plants was the next step, mixing and matching them to get a spread of crops. While in reality people would likely plant an entire row of plants the same, this kind of mix and match approach is more visually interesting. However, separating each row with wooden planks helps to reinforce a "planned" feel of a real garden, as do the fences on either end. There are also a bunch of tools stacked up against the house wall near the garden, indicating that it's well tended. The trick here is to ensure that you have an "idea" for what something is going to look like and not be wholly bound but what would be occur in the real world. The trick is to make something look believable and have a feel that fits while still making it look interesting and slightly random or chaotic. A truly regimented appearance is generally not aesthetically pleasing, and should usually only be used if you're trying to create a setting that specifically has that high degree of order. 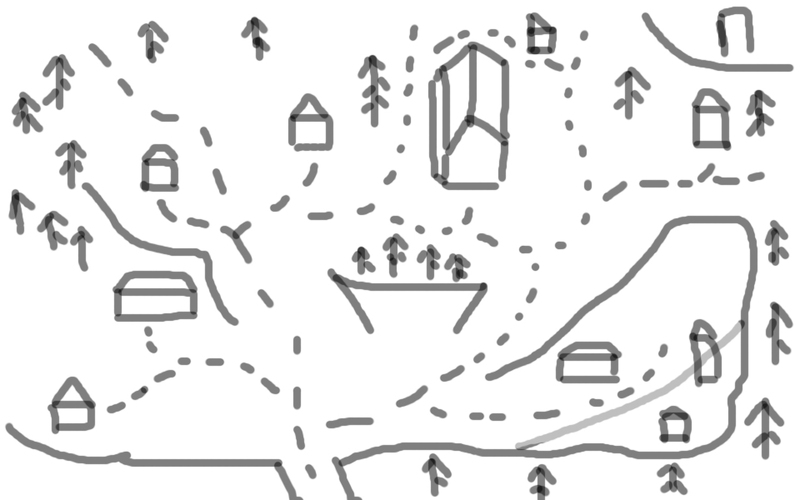 Level design is both extraordinarily complex and mind numbingly simple. 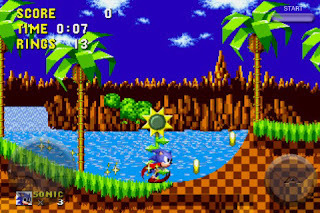 In essence, a level must be aesthetically pleasing and functional for gameplay. Simply put, it must look good and it must let the player play the game. Unfortunately, that is not a straightforward task. To demonstrate some of my thought processes, here's some of the steps I've taken on a level I'm currently working on. 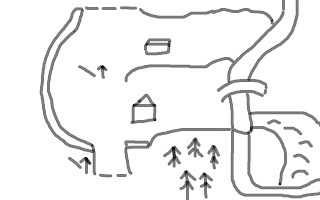 This is a simple design, a dual level area, with a stream off to the side. A few extra buildings would added here and there. The main problem is that this just didn't inspire me. Functionally it works, and there is the potential for it to look good, but it lacked "one simple idea". What I mean is the idea of a single view within the level that inspires you, and hopefully the player. You may end up with more than one of these per level, but you should make sure you have at least one of these in your mind before start building the level in an editor. I came up with this idea after wandering around in some bushland and combining different fragments of the landscape that I'd seen. The four trees in the middle on the edge of the cliff were my "one simple idea", and the view of a tower on the hill in the corner was another. Aesthetically I had more ideas that appealed to me and that I wanted to create. The only real problem I felt was that there could be a bit of backtracking, so I decided to add in a set of steps on the right hand side, which both would prevent that from occurring and also potentially add in another nice visual cue. I'm part way through developing the level now, so I won't really show much of it, but here's the view that started as the core idea for this level. It doesn't look that great because it's using default lighting and isn't decorated much, but the kernel of the visual appearance I had in mind is there. The final thing to remember is that fluidity in the design as it translates into an actual level is necessary. My final level will not end up looking exactly like the map as it was originally drawn, but the key visual and functional elements will still stay there. I've already made adjustments in terms of locations and tweaked the structure of the level, but the core layout for movement and the "visual cues" that I want to have present will all be there in the release version of the level. Some of you may have seen an article published by one Taylor Clark in The Atlantic about games and their validity as art. This article raised a bit of a stir in some circles, and I think it's an article worth discussing. Note that I'm going to have spoilers for both Braid and Red Dead Redemption in this article. Those games are both fairly old, so I figure I should mostly be safe, but there's the warning just in case. If you haven't played either of them, go do so then come back and read this article. They're both very good games with really interesting endings. The first thing to note from the article is the rather ugly and shameful bias that it displays. The unabashed and continuous praising of both Braid and Jonathon Blow is one of the worst examples of journalism I've seen in some time. Journalists should be presenting a balanced view of their subject matter, because to do otherwise effectively turns their work into a big long opinion piece. That's not journalism. That's a blog post or at best and editorial column. Part of the problem is that Braid is held up as a shining example of what games should be, and all other games are denigrated as meaningless and puerile entertainment fit only for idiots and juveniles. To dismiss something as having no real merit in an entertainment form simply because it does not meet one particular standard - in this case "being artistic" - belies the inherent benefit of diversity within a medium. If all games must be artistic in order to have worth, then the same logic must also be applied to movies, books, music, theatre and any other medium that can be used to communicate an idea to an audience. This issue is exacerbated by the shameless cherry picking of arguably the most artistically shallow counter-examples in order to attempt to prove this point. By picking games focused entirely on action and killing/shooting/fighting, Clark demonstrates an even worse bias than his continual praise of Braid. By failing to acknowledge even a single other game with depth in terms of storytelling, drama, theme or literary ideas, the argument comes across as completely and utterly uninformed. For those who don't know (seriously, you should play it, but this is your last chance) Braid is a 2D platformer about the story of Tim. 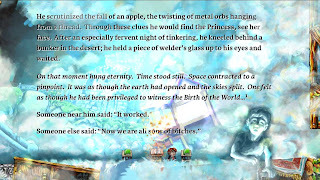 The game appears to be about Tim attempting to save the princess, as he travels through a series of levels fronted by narrative describing his attempts to find and reconcile his search for her. The game features some interesting time rewinding mechanics, which lead the player to solving puzzles in some fairly unique ways for a platformer. It has some well designed and thought out mechanics. I enjoyed Braid quite a lot, but as I was playing, something always felt a little off. There was some element of me that felt that the story wasn't quite right. The disjointed narrative wasn't confusing, but intriguing, both from a experiential and writing perspective. I found the writing to be missing an element of personalised emotion, as though the writer were taking ideas that they conceptually understood at a factual level, but did not emotionally comprehend the ramifications of the content. To me, it was as though it had been written by someone with autism or asperger's syndrome. This didn't make the game any less interesting, but meant as a player I was trying to insert real emotion into Tim's story because it only contained only the idea of emotion rather than emotion itself. The real disconnect came for me when I reached the game's epilogue, where it is revealed that "The Princess" referenced throughout the game is actually the atomic bomb, and that the game is seemingly about Tim's attempt to reconcile and repent for his role in The Manhattan Project. The disconnect wasn't the reveal itself, because it was always obvious that there was something more to the story, but the issue was instead with the manner in which the reveal was done. The revelation was delivered in an overly heavy-handed manner that shoved it down the player's throat. Up until this point, the game had been filled with allegory and intentionally vague writing, which was undone by explicitly naming the princess and issuing quotes from people involved in The Manhattan Project. By making the twist and overall story so patently obvious, Braid undid much of intrigue and interest that it had sparked up until that point. The ending to Braid was a disappointment because it could have been so much more. Maturity in atorytelling is not achieved through heavy handed delivery that verges on breaking the fourth-wall. The abrupt directness of Braid's reveal is a hallmark of immature storytelling, almost explicitly explaining the whole purpose of the game. Instead of providing evidence for the player to deduce the ending on their own, Braid comes out and directly states the truth of the game's mystery. Great themes and ideas should be present via the entire delivery of the work, rather than directly stated through a twist right at the end. For me, one disappointment was that an alternate scene does exist that would have gone some way to providing a meaningful ending without this heavy handed approach. If the player obtains a series of stars in the game (all of which are very obscure and difficult to obtain), it is possible for them to (again, through an obscure process) actually touch the princess as part of the game. This does not occur as part of normal gameplay. Upon doing so, the screen flashes white and an explosion noise sounds. When the white fades away, the Princess is gone. In the context of having already seen the heavy handed ending, this series of events makes complete sense, but devoid of it, it is a strange occurrence that is obviously symbolic, though it would be up to the player to determine its significance. At this point, the game could have simply forced the player to rewind in order to proceed, just as it does in the "normal" ending, and none of the symbolism of that ending would have been lost. Conversely, Blow has directed much criticism at Red Dead Redemption, for being about a father figure attempting to obtain redemption, but in attempting to do so, the player must murder hundreds of people during the course of the game. Blow's argument is that the murder undermines the portrayal of the lead character of John Marsden. The unfortunate thing here is that Blow has missed the entire point of the storytelling and the game's climax. It's true that Marsden kills repeatedly during the adventure despite being cast as a "good" character, but the tale ultimately describes how he is unable to escape the burden of his past as a criminal. That Blow fails to understand this is slightly ironic, given that this idea has strong parallels with his own story within Braid. Moreover, it fails to see the larger picture that is delivered in the game's climax. 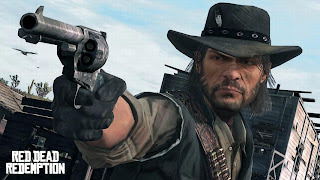 John Marston isn't meant to be "good"
After many hours of tribulations working for the Government in order to bring his former criminal friends to justice, Marston is finally set free and allowed to return to his home. This is not without a great deal of argument with his employers, who have repeatedly demonstrated their unwillingness to let Marston go, and forced him to do more than they initially asked. Marston returns to normal life with his family and the player herds cattle, delivers supplies, teaches his son how to hunt and otherwise lives a normal life. This is undone in the final mission of the game, where Government troops come for Marston. Sending his wife and son off to safety, Marston barges out of the barn and attempts to take down the Government troops, but after the player empties their weapon, the game removes control and shows Marston dying in a hail of bullets. The game jumps your control to that of his wife and son riding away on a horse, who hear the gunfire. You yhen ride back to the farm to find John Marston dead. 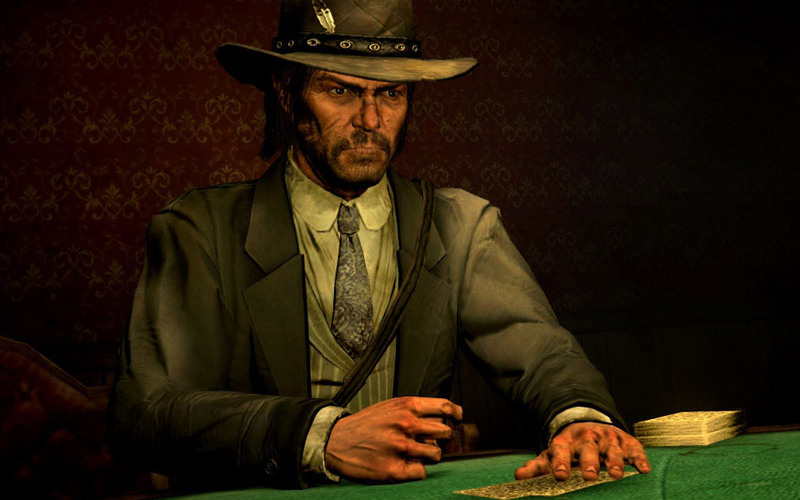 Red Dead Redemption in this sequence tells the player through its actions, gameplay and visuals that there are some debts that may never be paid off without paying the ultimate sacrifice. Marston has spent the entire game trying to escape his old life by effectively reliving it, which is ultimately a futile endeavour. 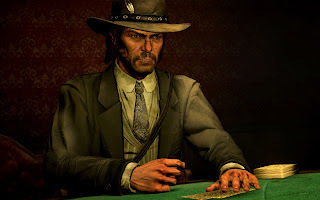 Despite a game spent searching for redemption through murder, Marston only eventually finds redemption for his misdeeds by sacrificing himself to save the lives of his family. The game did not feel the need to have a voice over to explicitly tell the player this or otherwise deliver this message in a heavy handed manner, because it was more mature than that. What the writers at Rockstar recognised that Blow did not is that by allowing the player to interpret the meaning of their work rather than being explicitly told the meaning, their storytelling was inherently more meaningful and mature. All analysis aside, perhaps the most stupid thing is the necessity that some people seem to have to insist that games must be "artistic". For starters, no one can define what is meant by "artistic". What some people consider to be "art" is not by others, and the same goes for things considered to be "artistic". What is worse is that this train of thought stems from a viewpoint that games are somehow an inferior storytelling medium or entertainment form. It is as though unless video games can be considered art by some arbitrary measure, that they are somehow a childish pursuit or lesser creations. There seems to be an insistence on claiming that video games are dumb, even when this is often because people make them so by analysing them at only the most perfunctory level. Attempts to be deliberately artistic, which is largely Braid's modus operandi, are not necessary to prove the maturity of games. If anything, this approach smacks of a pretentious attempt to be sophisticated rather than simply being sophisticated. Simply put, Braid is one of a number of games that are trying too hard. Nevertheless, Braid still (mostly) succeeds at being intelligent and thought provoking, but that is in spite of its blatant attempts to be "artistic" rather than because of it. Games do not need to deliberately attempt to be artistic. Games can be artistic by their very nature. 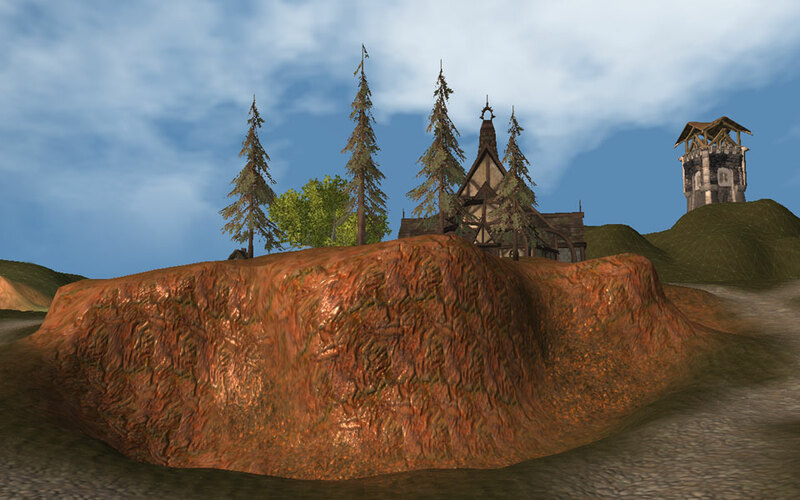 Every time a player stops to admire a beautiful virtual landscape, a game is artistic. Every time someone stops to consider their actions and consequences before acting, a game is artistic. Every time a discussion is held about the "real meaning" of events, scenes or dialogue in a game, that game is artistic. Every time a game inspires emotion in a player or even those people watching it, a game is artistic. To deny otherwise would be to deny the integrity of any other artistic medium. If someone wants to denigrate games as a medium lacking merit, then they simply don't understand them. For gamers or game designers to carry around a chip on their shoulder and take every opportunity to insist and showcase "how artistic they are" is a path that will lead to pretentiously vapid games, more obsessed with being art than actually being art, or a game, or an interesting storytelling medium.